Daldorado is the ONLY American company to design & engineer its APSP-16-2011 Main Drain grates, whether new or VGB replacement, to give a 25 year service life. Virtually any size or shape can be constructed from design specifications. 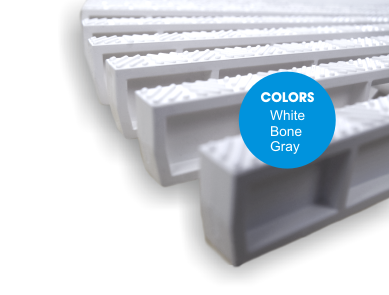 Frame and grate made of high-grade UV-stable PVC (Axiall 7140) ~ Certified for NSF50. Stainless Steel screws and instructions included. *Some restrictions may apply. Please contact us for more information. Bare feet and wet pool decks can be a dangerous combination, which means keeping your patrons and visitors safe is of the utmost importance. Through state-of-the-art engineering and rigorous testing, Daldorado’s grating features a powerful grip, slip-resistant surface profile that exceeds IBC standards (ramp testing). Its herringbone design quickly disperses water to prevent mold or mildew growth. Pool images shown may or may not be an actual representation of a product provided by Daldorado.